A first birthday is a special occasion and deserves a gift from the heart that is just right for the little one in your life. 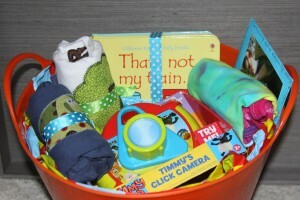 I love to make gift baskets to give to anyone – but a first birthday is an especially fun reason to put one together. A combination of homemade shirts, age appropriate board books, and a small toy are the perfect gift for any little one on their first birthday. Last summer we had a first birthday party for one sweet little guy in our family and I was so excited to make him something special for his big day. I love to get my own kids involved in the gift giving process and always ask them to help with the process from picking things out to wrapping them. I want them to start thinking early in life about how it is better to give than to receive, and I love their excitement as they watch their gift getting opened. For this particular gift I decided I wanted to include some homemade shirts. I remember after my son turned one it was the first time that I didn’t have a lot of clothes stocked up for him. The baby shower helped cloth him through his entire first year, and when he turned one we were running low. I love to give clothes as gifts for 12 months and up in hopes that it helps Mom and Dad with that dilemma. 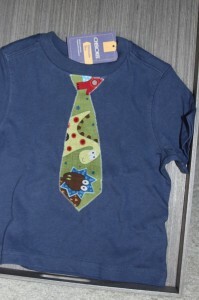 I made two appliqued shirts in different sizes for the little guy, that I hoped would fit his personality and Mom and Dad’s style too. I love making appliqued shirts as gifts because they are totally unique, fun, inexpensive, and easy to make personalized. I choose to make him a dinosaur tie onesie that turned out adorable. I gave my son a few fabric options and he picked the dinosaur fabric special for his little buddy’s birthday. 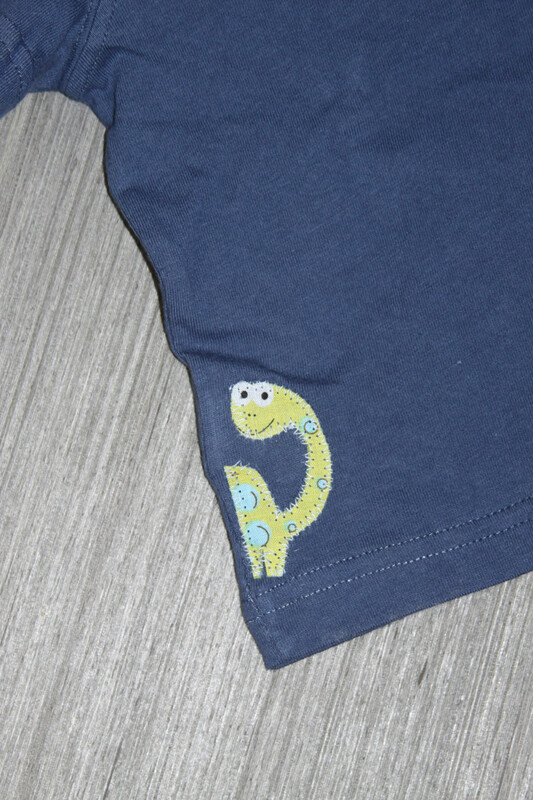 I even hid a little dino peeking around the back of the shirt. I also came up with a simple design with tree and added the word hugger underneath. I thought it would make a quirky little shirt for the little guy to sport. 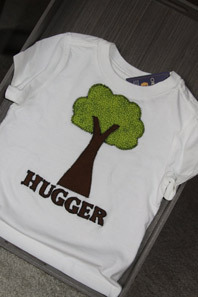 Even little ones can encourage living green and I’m sure he looks adorable in his Tree hugger shirt. The final shirt that I included in the gift basket was my favorite. 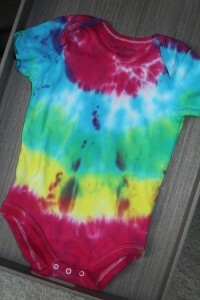 I enlisted the kiddos to help make a tie-dyed onesie in bright beautiful colors for the little one to wear all summer long. 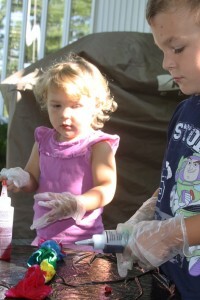 The kids had a great time dying the shirt and found the entire process fascinating. They could barely wait to tell everyone that they made a shirt for the little one’s first birthday. I loved how much pride they took in making and giving a gift themselves. I also printed a picture of them making the shirt and attached it to the onesie with a note stating that the kids made it special for him. Along with the shirts we added a couple other goodies to the basket. The kids each picked a special board book to add, and they were put in charge of picking one small toy appropriate for a one year old that was under five dollars. At one year, I think keeping toys simple and small is best, so I try not to go overboard on the toys when I give gifts. They agreed on a brightly colored toy camera that made fun picture taking sounds. It was the perfect addition and finished off our gift basket perfectly. 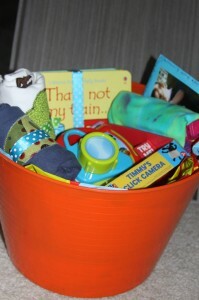 I love to combine things that are useful along with things that are fun for little ones as gifts. Our gift ended up including 3 handmade shirts, one small toy, and two board books. I wrapped a few things in brightly colored ribbon for easy opening for the little guy. 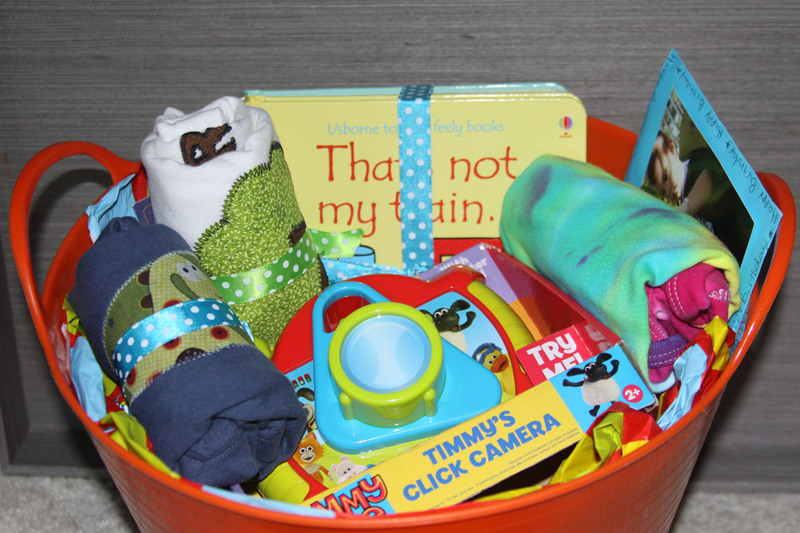 Instead of putting it in a gift bag or box, I love to opt for a cute plastic tote that is the perfect storage solution for the many little toys and books that a one year old usually has. Although it is fun for a little one to open wrapped boxes, at that age, they usually loose patience after a couple gifts and would rather play in a box than open another gift. Knowing he would have plenty of opportunities to unwrap a gift, I just put a little paper in the bottom of a reusable tub and left the gifts exposed on top wrapped in ribbon. That way it is easy for little hands to see what is inside quickly. Hopefully he enjoyed his gift, and got a lot of use out of everything in the basket. I was so proud of my own kids, and how much thought and effort they put into the gift as well. 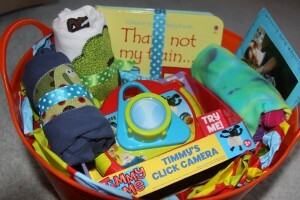 I can’t wait to make another gift basket for his next birthday!